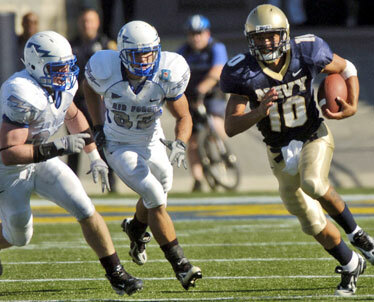 Kapolei graduate Kaipo-Noa Kaheaku-Enhada averages 83.3 yards rushing as Navy's QB. BALTIMORE » Navy head coach Paul Johnson has taken a page right out of Vince Lombardi's playbook. When Lombardi was guiding the powerful Green Bay Packers in the 1960s, his philosophy was "stop us if you can." With Bart Starr controlling the offense, the Packers appeared invincible and tended to run the same play again and again until finally stopped. Johnson's Navy teams have been so efficient in operating the option that they dare teams to confront their execution. While compiling impressive numbers in the past, the 2007 season has been particularly productive. With Kaipo-Noa Kaheaku-Enhada, the Star Bulletin's 2004 player of the year at Kapolei High School, running the controls at quarterback, the Mids' offense hasn't missed a beat. Navy leads the nation in rushing, is ninth in scoring offense and third in fewest penalties. All of which accentuates Johnson's desire to utilize the option for maximum efficiency. "I always believed you win through the running game," Johnson said this week. "The option, and I like to use the double slot, gives you great flexibility in several areas." While passing remains a subordinate option, the key to Johnson's offense remains execution from the quarterback position. For 2007, Kaheaku-Enhada appears ideal. The junior has put together a monster season, with two of the seven longest runs in Navy rushing history. He averages 83.3 yards a game on the ground (fourth in the country among quarterbacks), and he has topped the 100-yard rushing mark six times in his Navy career. "Kaipo is a good fit," Johnson added. "He has a good understanding of what we want to do, and gets us in the right situation." Johnson's use of the option has translated into success at every stop. Prior to coming to Navy in 2002, the 50-year-old native of Newland, S.C., led Georgia Southern to the Division I-AA national championships in 1999 and 2000. As an assistant coach for eight years at Hawaii, Johnson ran offenses that broke or equaled more than 160 school records. He then moved to Navy as offensive coordinator for two years before directing the successful run at Georgia Southern. Johnson took over a Navy program that went 1-20 in the two years before his arrival. Despite a 2-10 mark his first season (2002) in Annapolis, Johnson had the Mids moving in a positive direction. Over the subsequent four years, Johnson's teams compiled a 35-15 record (.700) and his career winning percentage of .744 ranks 10th among active coaches in college football. All of which makes Johnson an attractive candidate for a high-profile job. In a conference call with reporters earlier this week, Johnson was asked about the Nebraska and Texas A&M openings. As soon these questions were asked, Mike Sherman was brought in for the Aggies job. That left interest and/or desire to work for Tom Osborne at Nebraska. "It seems like the same thing every year," Johnson said. "People are talking about this job and that job, and I'm still here. I don't pay any attention to that stuff." While his name continues to be linked to coaching positions around the country, Johnson does recognize the attention. "When your name comes up like this, it's a compliment to you and the job you're doing," he added. "Frankly, my focus is the Army game and getting my team ready and prepared to play Saturday."